Sorry to hear you have been ill. Hoping you are back to full speed very soon. Thanks again for all your tutorials. I use them lots! Thanks for the great tip! I just might have to make myself a peasant top and try it out. Hope you feel better soon. I do hope you're well soon. I thought of you quite a bit while sewing a shirt for my daughter...used your collar point tutorial and I'm sure that I unconsciously used several others. I do appreciate your expertise that you've shared with us, as well as your WONDERFUL interfacing! I am so sorry to hear of your illness, and hope you get better soon! Thank you so much for sharing your knowledge and advice! I love learning these little techniques which make big differences! Thanks again Pam for your expertise and sharing it with us. Great tip and can't believe I've never sewn the elastic this way before. We're with you in believing for complete restoration and very happy that you are with us and encouraging and mentoring our sewing community. God speed. I always thought that "elasticated" was the British English version of "elastic". Like they usually say "orientated" rather than "oriented". You can of course have a casing for something other than elastic, so it's important to say something! Great hint - the topstiching. May God's grace and peace be with you as you cope with this illness. 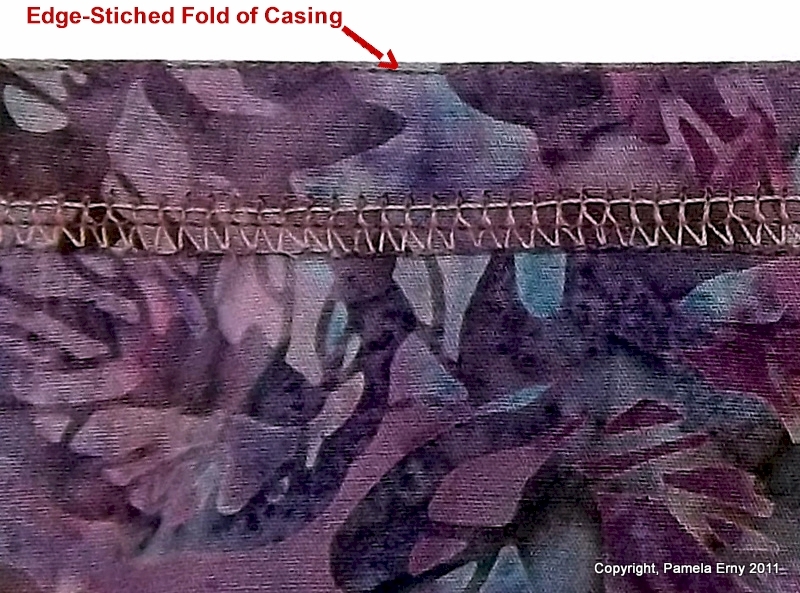 Thanks Pam, for sharing your sewing secrets! I've come to the conclusion recently that elastic may well be the answer to my fitting and flattering issues, so it's nice to see a way to make it a bit smarter. Thanks for a great tip. So sorry to hear of your illness and hope you get well soon! Thanks for this tip. I have the original HP pattern and want to sew it up now that I have seen your wonderful version. Hope you get better soon. I read this tip when you first posted it. Since that time I started to edge stitch my casings and the result is so professional. I am always surprised that this little step can make such a difference. Wishing you a speedy recovery. Get well soon Pam. I love your interfacing so must try more of your range of elastics. The clear elastic has been great! Warmest wishes from Australia. Hope you are well soon!!! Great tip! I will remember this, and as we all (should) know, your elastic is the best! Hope you're feeling lots better. Thanks for this great tip on the "elasticated" casing. I think I like saying that word, too. I hope you are over this health hump real soon. We all rely on your expertise and wonderful products more than you know. Thanks Pam! Best wishes for a full and speedy recovery! Thanks for another great trip. I am so glad to read your post. This morning I was irong a shirt I made for my husband and I thought of you and hoped you were ok the sewing community is fabulous. I love your blog and thank you for this tip on the elastic casing! I just made the Meghan Peasant dress recently. My next one will be even better thanks to you! I wish you well with your recovery! Take care of yourself, hope you are feeling better soon. We are cheering for you! Hi Pam. I truly hope your health is fully restored very soon. Thank you so much for this and all other really great tips you share with us. Take care. I appreciate your blog so much! Thank you for sharing all these wonderful tips with us. I hope you make a complete recovery soon. Your blog offers SO much of value. I really appreciate it. I hope your condition improves or that you will find more support and resources to handle it. My thanks and very best wishes. I am so sorry to hear you have been ill, I hope this is something you can overcome- sending healing vines and prayers.